While BJP is expected to improve its numbers only marginally in Rajya Sabha after the biennial election on June 11, prospects for passage of the GST Bill looks up as Trinamool Congress has announced its support for the key legislation. Soon after her win, West Bengal chief minister Mamata Banerjee declared TMC’s support to the stalled Goods and Services Tax Bill in Rajya Sabha. The poll setback to Congress and Left, the main opponents to the bill, will mean that their tally will not increase. On the other hand, support of TMC and other regional parties could increase the pressure on Congress to reach an accomodation on the tax measure. 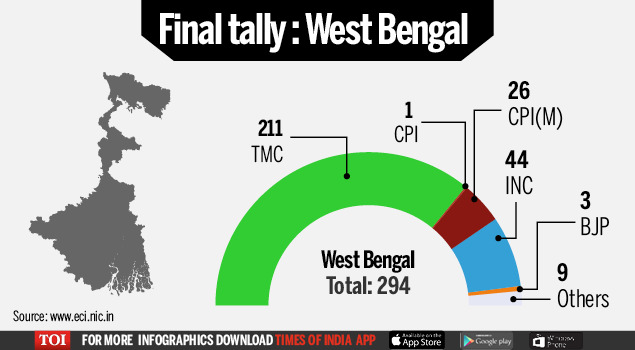 With NDA due to improve its tally in RS , TMC’s support will add 12 crucial votes if the GST Bill comes up for division. Moreover, for the first time, NDA will overtake UPA’s tally in RS with BJP and its ally TDP possibly getting seven additional seats. Though just TMC’s support won’t allow the government to cross the Rajya Sabha hurdle, NDA may hope to garner support of other “non-NDA and non-UPA” parties like Samajwadi Party, BJD and the BSP. These parties may together tilt the balance in favour of NDA either by voting with it or just by abstaining to bring down the half-way mark. While AIADMK had earlier opposed the GST Bill, keeping in mind the state’s manufacturing base that would be affected by such a law, the party may be open to striking a deal as its opposition is not ideological or obstructionist. The party, with its impressive show in Tamil Nadu, will gain one additional seat in RS after its biennial election next month. The BJP’s big win in Assam will, however, not immediately help the party increase its tally in RS as there will not be any vacancy in the Upper House from the state until June, 2019. Victorious parties in West Bengal, Kerala and Puducherry will also have to wait before their numbers can get a boost. Elections to 57 RS seats from different states, including Tamil Nadu, Maharashtra, Haryana, Madhya Pradesh, Chhattisgarh, Bihar, Andhra Pradesh, Telangana and UP, will be held next month. Most of these seats in the Upper House will be vacant during June-August. It is expected that the BJP will win four additional Rajya Sabha seats while the TDP may win three others in the biennial election. As against its 14 retiring members from different states, the BJP may get 18 seats – a net gain of four seats in the biennial election. Six of these 57 seats will be vacant from Tamil Nadu due to retirement of members after the completion of their six-year term. Three of them are from the AIADMK, two from the DMK and one from the Congress. It is expected that the ruling AIADMK will win four seats – gain of an additional one seat – backed by its strength in the state assembly and the DMK would be able to retain the remaining two. The NDA will have an advantage of nominated members as well. The President, on recommendation of the government, had nominated six members last month while one seat still remains vacant. If the government takes a call on the vacant seat, it will have an advantage of total seven votes. Two of the six nominated members have already decided to accept the whip of the ruling BJP.